For those living in or visiting New York City this May and June, the Seattle-based firm Olson Kundig is partnering with the Brooklyn-based artist Duke Riley on a weekend public art performance and installation piece, Fly By Night, in the Brooklyn Navy Yard. (Event tickets are sold out, but there is a waitlist.) The non-profit arts organization, Creative Time, commissioned the piece. 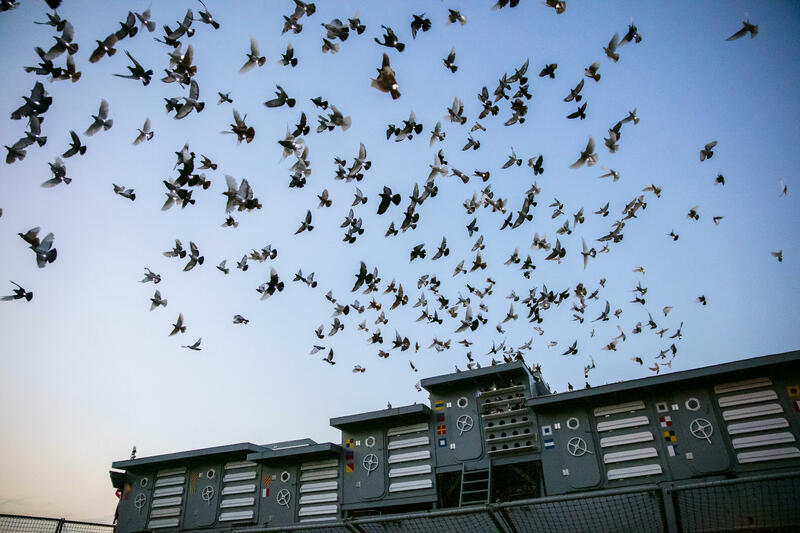 At dusk on Fridays, Saturdays, and Sundays through June 12, the artist will awaken a flock of close to 2,000 pigeons living in a group of Olson Kundig-designed pigeon lofts resting on the docked and decommissioned Navy ship, the Baylander. The artist outfitted the pigeons with glowing LED leg bands. "We raise a flag and the birds then know to take off and start flying in different patterns," Riley told the New York Times in a short video. https://vimeo.com/164326694 Riley was inspired by the site's former use as the military's largest pigeon coop. During World War II, the military used pigeons to deliver messages in the dead of night, with some pigeons traveling up to 600 miles in a single flight. “The artist has a clear love for these pigeons and it came across in the design thinking behind the pigeon coops," said Olson Kundig Associate Kristen Becker, who worked with Riley on the pigeon lofts, in a statement. "The idea that the coops were designed to exist beyond the performance resonates in the way in which we detailed the piece. Each coop bay was designed not only to be installed quickly but also to be dismantled to be reused and donated as individual coops afterwards. Instead of thinking of it as one building—we thought about it as a series of buildings." After around 30 minutes, Riley calls the pigeons home with a whistle. Becker also designed 25 bird houses, taking cues from the Fly by Night pigeon lofts, for the April 28 Creative Time Gala, to help raise funds for free public access to art. Between glass curtain walls and art installations, birds just can’t catch a break. For their Venice Architecture Biennale project Pigeon Safari Swiss artist Julian Charrière and German photographer Julius von Bismark captured, airbrushed, then released the pigeons of St. Mark’s Square. 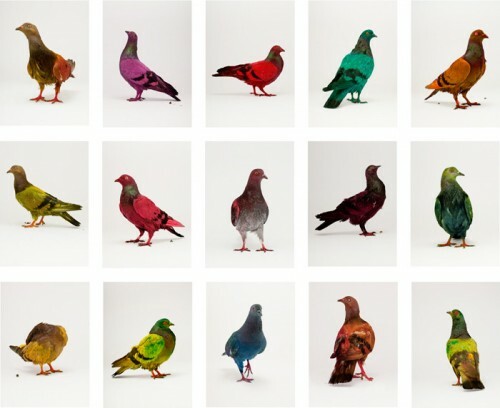 The resulting rainbow-colored flock has caused Biennale-goers and tourists alike to do a double take. Charrière told the Italian newspaper Corriere della Sera, “Pigeons make up part of our urban landscape, but we view them as though they are an unrecognizable mass, whereas each one has its own identity.” While a newly teal pigeon may imagine itself a peacock, conservationists expressed concern that the birds’ unusual colors would deter mating.